On Friday, whilst most boxing fans were preparing for the World Super Series final between George Groves and Callum Smith to be beamed over from Saudi Arabia, I made the trek up from my London home to Derby for the weigh-in at the Stein Strasse Bar in the City for an event at Pride Park the following day. Have to say I’ve been to quite a few weigh-ins, but can’t recall any here in the UK that could be termed an event in themselves. The only one even remotely similar I can recall attending was at the Hard Rock Cafe in New York back in 2007. With so much effort put into the presentation of the weigh-in, I have to admit I was feeling right up for the event itself the next day, as I made my way to Pride Park, and as it turns out quite rightly so. 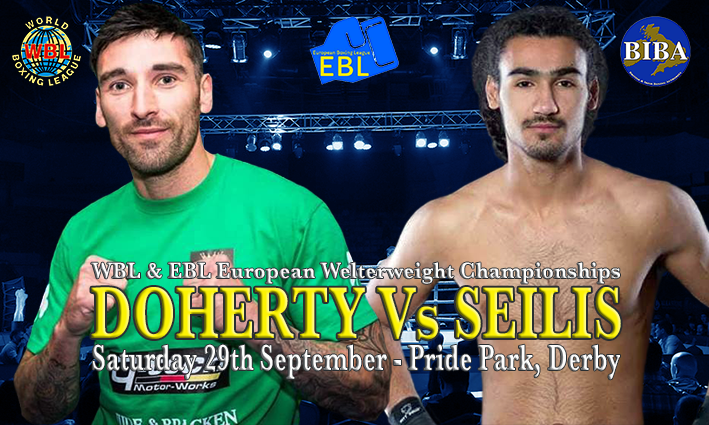 The headlining fight, that featured Derby’s very own Ross Doherty and Latvia’s Gvido Seilis, was for both the World Boxing League (WBL) and European Boxing League (EBL) European Super Welterweight Championships. As the opening bell both combatants strode to centre ring and entered into the battle more akin to mortal combat of Roman Gladiators than modern day Pugilists, such was the sheer eruption of violent combat that ensued. As like Warriors from the past Doherty and Seilis positioned themselves face to face across the battleground, neither willing to concede a single inch in the battle for superiority of the first stanza. Wow, fantastic all action first round. Doherty’s power and precision earned him the first couple of rounds in my eyes, but in the third it was Seilis that caught the eye, he stepped up the pace and began to dominate much of the round, backing up the Derby man with big solid straight rights. Initially early in the fourth it was again Seilis in the ascendency, however around the minute mark Doherty got behind his jab to open up opportunities for him to let rip with some big rights of his own and soon wrestled back control of the round, as well as the next two or three. Seilis came out hard and fast in the seventh and went to work on the body and head of Doherty, forcing the Derby man to be a little more defensive than he had in the previous rounds. The next couple of rounds were really close, one or two way too close to call in my view, as both protagonists went toe-to-toe from start to finish of each round. The tenth and final round was sensational it was an incredible Battle Royale, have to admit didn’t expect the round to reach it’s natural conclusion as both Warriors dug deep into their arsenal, as well as both threw caution to the wind and began hurling and landing power shot after power shot. What a sensational round. After ten magnificent rounds of boxing it was to the scorecards. Judge Adrian Thorne 98-95 – Judge Mark Wakefield 99-94 and Judge James Ancliff 99-92, all in favour of Ross Doherty, the new WBL & EBL European Super Welterweight Champion. 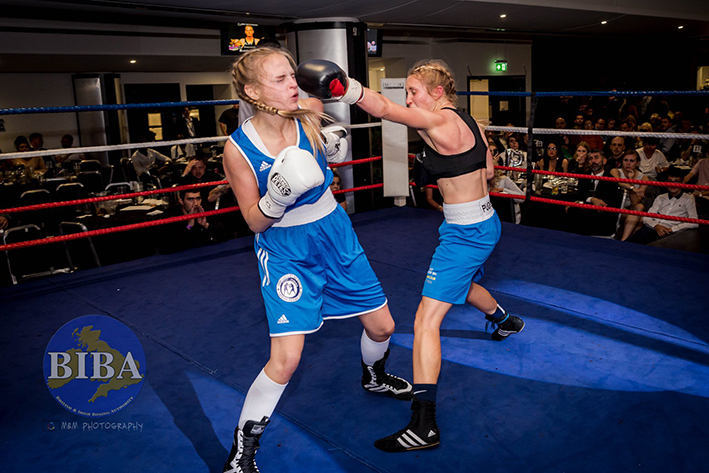 The penultimate contest of the night see Wolverhampton’s Emily Pugh (1-0-0) making her second professional outing, against Latvian débutée Veronika Sirajeva. Right from the off Sirajeva shot across the ring and began firing massive power shots that not only forced Pugh to cover up but also initially silence the Wolverhampton girl’s highly vocal fans. After the initial shock of seeing their adored heroine taking such an onslaught from the newcomer, they soon became highly vocal again calling for Pugh to counter with equal force (sounds far better than ‘smash her head in’, which was the gist of the shouts), Pugh responded forcefully to gain a semblance of control. What ensued then was a full on war, with neither conceding an inch of ground to the other. Phew what a round, seriously couldn’t split them – points wise, neither could Referee Rob Jones who scored it a draw. Again in the second Sirajeva started hard and fast, however this time after an initial covering-up, Pugh responded with equal venom before getting behind her supremely strong jab to keep the hard charging Latvian at bay, well to a degree. Similar in the third, however in the fourth it was Pugh that forcefully secured centre ring early on. Utilising her excellent jab Pugh began to control the proceedings. As the round progressed Pugh forced her way through the Latvian’s guard, landing solid shots on Sirajeva’s chin and nose. Prior to the start of the fifth Sirajeva’s coach summoned Referee Rob Jones and informed him that the talented young Latvian was unable to continue due to injury. To describe the roar of joy from Pugh’s fans that echoed around the rammed to the hilt Pedigree Suite at Pride Park when Rob Jones waived off the contest, as loudly ecstatic would be like describing the Derby County fans reaction to the Rams’ victory over Manchester United just a few days earlier as just plain chuffed, seriously it was intense. For the record after four rounds Referee Rob Jones’ scorecard read 40-37 in favour of Emily Pugh. Prior to the Pugh-Sirajeva contest, was the second Championship contest of the evening, an all Merseyside Derby between Paul Peers and unbeaten Craig Kennerdale. As if the fact it was an all Merseyside Derby wasn’t enough to add that extra element of spice to the contest, Peers is an avid Everton fan, whilst Kennerdale a fanatical supporter of Jürgen Klopp’s high flying Liverpool and more importantly there was a title on the line, the vacant Professional Boxing Council (PBC) Silver English Welterweight Championship. Right from the opening bell it was a full on war, both lads going toe-to-toe letting rip with power punch after power punch. By round three it was clear that it would be impossible to tip a winner, first round you couldn’t split them, neither could the judges, the second going to Kennerdale and the red side of the City and the third to Peers and the blues. The fourth was a bloody affair, with both Kennerdale and Peers bleeding from the nose, have to say what a round though, it was pugilistic heaven to watch as both protagonists went full on for the full three minutes. The fifth was very much in the same vein, as was the sixth, and once again control was switching back and forth. Kennerdale gained the upper hand, just, in the sixth after stepping up the already scintillating pace. Not to be outdone Peers stepped it up further and took control of the seventh. To describe the eighth and final round as sensational would have to be deemed the understatement of the year, it wasn’t a war it was Pugilistic Armageddon, so much so there wasn’t a single person seated, the entire audience on their feet screaming their support for one or t’other, even the neutrals in the house bellowed, so enthralling was the round. The frenetic tension, of the combatants and their teams as they awaited the scorecards to be read, was palpable to all in attendance. 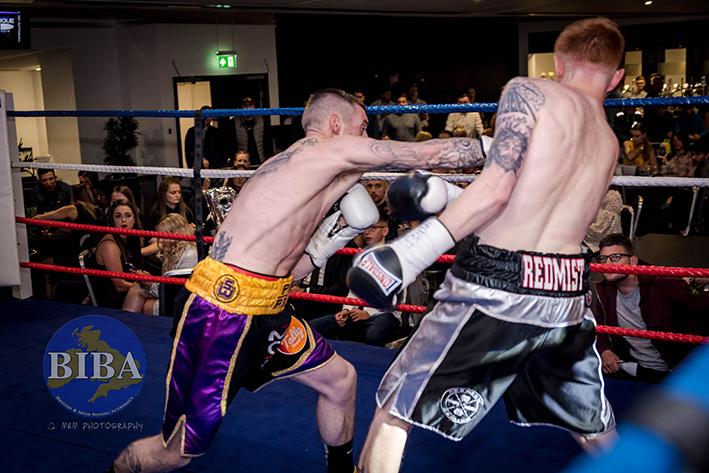 The stress only easing after the cards were read – Judge Adrian Thorne 78-78 (Drawn), Judge Mark Wakefield 78-76 in favour of Peers and Judge James Ancliff 78-77, also in favour of Peers, who claims the PBC Silver English Welterweight Championship accolade. Have to say this was an awesome fight, one that very much deserves the Fight of the Night honours, and I’m sure many will agree with me also a future rematch. Second fight of the night pitted Bardney, Lincolnshire’s unbeaten Nathan Decastro (13-0-0) against Accra, Ghana’s Agoe Ashong (11-1-0) for the vacant Professional Boxing Council (PBC) Super Middleweight Commonwealth Championship. Both protagonists went for it hard and fast right from the opening bell, however it was Decastro that wrestled initial control, forcing the Ghanaian back onto the ropes with a series of powerful hooks to the body. Each time Ashong attempted to slip or spin away, Decastro bought him straight back in-line with a big hook to the body before proceeding to punish the Ghanaian’s body and head with big powerful lefts and rights, which set the standard not just for the rest of the first stanza but also the next couple of rounds. 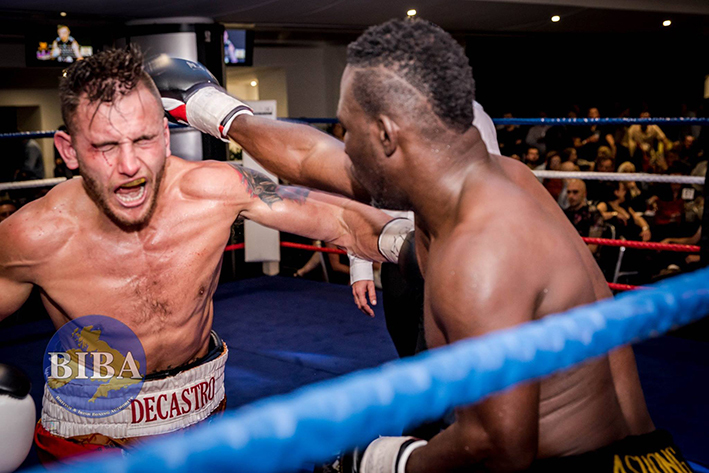 Whilst the first few rounds could have been fought in a phone box and Decastro very much had the upper hand, it soon become a totally different affair, as fate dealt Decastro a mighty blow. During one of the many full on exchanges in round four Decastro sustained a leg injury, later confirmed as a pulled hamstring. Ashong sensed the opportunity to turn the fight in his favour and went hard on the attack, throwing a huge right, Decastro countered, The Ghanaian let rip with a double-handed flurry before dancing away. Decastro tried to close Ashong down and let rip with a big right, but the highly mobile Ghanaian slipped under the lightning fast Exocet and danced around the mobility challenged Englishman before letting rip with big right of his own. From this moment on Ashong switched his tactics, dancing around the ring, virtually goading the limping Englishman into wild swinging attacks, initially Decastro obliged and in doing so presented Ashong the opportunity to get the upper hand and land some powerful shots. However, savvy words from his corner in the break see Decastro change his tactics and instead of trying to chase the fast moving Ghanaian around the ring, slowly but surely cut-off the ring until in a position to back Ashong onto the ropes or into the corner before making a sustained attack. Right from the opening bell of the twelfth and final round Ashong stepped up his attacks, going full out to try and secure a knockout, secure in the knowledge that this would be the only way he could achieve victory. The fact that Decastro was virtually static by this point must have made the Ghanaian confident that this tactic would be successful, however Ashong hadn’t taken into account the Englishman’s determination or his world class ring-craft. Decastro, even with the debilitating injury, weaved and slipped each attack before countering with good success, more importantly he didn’t let Ashong drag him into a slugging match for the final minutes, which was surely enough to secure a hard fought victory. Decastro and his team nervously awaited the scores to be read out, whilst Ashong and his team confidently had their hands raised, but the confidence in the faces soon drained as the scores were read out – Judge Adrian Thorne, 119-108, Judge Mark Wakefield 120-108 and Judge James Ancliff 119-109 all in favour of Decastro. Opening fight for the Professional element of the event see Jack Jones from Leeds making his professional debut against Dundalk, Ireland’s Michael Kelly in a four round Super Welterweight contest. Jones started the contest confidently, taking the fight to Kelly and displaying some nice slick moves, much to the delight of his many fans that had travelled down the M1 from Yorkshire. As the round progressed Kelly began to slowdown the ever-forward movement of the Leed’s youngster by displaying the exceptional skills that earned him a shot at the WBF international title a few years back. Jones responded well to the test, initially countering before taking back control of centre ring with a forceful control that put the Irishman back onto the back foot. Jones virtually controlled the next couple of rounds, except for short episodes where Kelly would wrestle control and test his young opponent’s metal. The fourth and final round was a cracker, Jones had settled into a flow and looked to be well and truly in control of the proceedings, interrupted only by flashes of pure brilliance from Kelly, unfortunately not enough for the Irishman to prevent Jones from charging on to a clear 40-36 points victory. This was my fourth visit to Derby to attend Dan Gray’s events, each has been superior to the previous, not just because of excellent genuine fifty-fifty contests that he features, or the fantastic venue, but also his dedication to making his shows a fantastic night out for the fans with additional entertainment. On Saturday night the venue had a Casino theme that included Roulette and Games tables, a Magician and an awesome singer, OK I admit I was only there for the Boxing, but also have to admit I really enjoyed the entertainment too, can’t wait for his next show. Back in April this year Emily Pugh made her professional debut, and boy oh boy did she do it in style. Emily and her opponent Jelizaveta Cerkasova, who was also making her pro debut, put on a master-class. The contest was a true master-class, but not in the normal sense of the word as used within boxing circles, whereby one boxer ‘gave a master-class to their opponent’, oh no it was a true closely fought master-class of boxing full stop, one of the most enthralling boxing matches in a long, long time, one that is only matched by the even more recent ‘Fight of the Year’ nominated World Boxing Council (WBC) Atomweight World Championship contest between Emily’s fellow British & Irish Boxing Authority licensed boxer, the former WBC Muay Thai World Champion Denise Castle and WBC World Youth & International Champion Fabiana Bytyqi. This coming Saturday, at Pride Park, in Derby, Pugh is set to step into the ring for her second pro bout, this time the Wolverhampton Girl is set to face Latvia’s Veronika Sirajeva on the undercard of the WBL & EBL European Championship contest between Ross Doherty and Gvido Seilis and co headliner Nathan Decastro versus Agoe Ashong PBC Commonwealth title showdown. “I am very excited to get back into the ring, and more than ready. “I am looking forward to boxing six rounds. I intend to win them every one of these rounds with a strong performance, in style. “My professional debut seems so long ago, and I know that I can top that performance and put on a strong fight. “I hope my opponent has worked as hard as me and is ready to give it everything she’s got. Emily Pugh versus Veronika Sirajeva is a support bout for the Ross Doherty versus Gvido Seilis for the World Boxing League (WBL) and European Boxing League (EBL) European Welterweight Championships, that co-headlines with the Nathan Decastro versus Agoe Ashong, for the Professional Boxing Council (PBC) Commonwealth Super Middleweight Championship contest on the Daniel Gray promoted event at Pride Park in Derby on Saturday 29th September 2018. 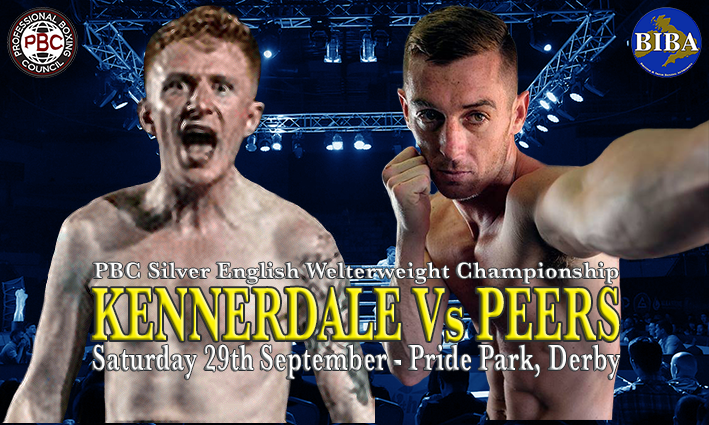 Also featured on the event is another mouth-watering all Merseyside title clash, between Craig Kennerdale and Paul Peers for the Professional Boxing Council (PBC) Silver English Welterweight title and Leed’s Super lightweight Jack Jones makes his professional debut against Dundalk, Ireland’s Michael Kelly. The event is virtually sold out but there are a few tickets still available, for details please call Dan Gray on 07522 401454. Posted in Female Boxing Tagged Agoe Ashong, Craig Kennerdale, Dan Gray, Derby, Emily Pugh, Gvido Seilis, Jack Jones, Michael Kelly, Nathan Decastro, Paul Peers, PBC, Pride Park, Professional Boxing Council, Ross Doherty, Viktoria Sirajeva Leave a Comment on Rising Star Pugh Back In Action This Saturday, Faces Sirajeva at Pride Park, Derby. Over the past year or so there’s been a lot of speculation, or should that be desire, about the possibility of an all Merseyside showdown between local heroes Craig Kennerdale and Paul Peers. Until very recently it had been just pure wishful thinking, it had been proposed on numerous occasions and failed to be made, however come Saturday night this much anticipated showdown finally becomes a reality, as promoter Dan Gray decided enough of the talking, if the fans want the fight, they should have their wishes come true and added it to the card for his upcoming event at the home of Derby County FC, Pride Park in Derby. When Dan Gray first proposed the fight to Paul Peers, Peers had told him “Good luck mate, others had tried to make the match-up in the past and failed.” Not to be deterred Gray not only convinced Kennerdale’s manager Kyle Gallagher that the time was right, but also the unbeaten prospect himself. Speaking from his Liverpool home Craig Kennerdale explained why he decided to take the fight now. “I always knew that Paul and I would face each other one day, but always expected it to be much later on in our careers, but when Dan (Gray) dangled the carrot of making it for a title, my first title shot, I just couldn’t refuse. “I’ve been waiting for this opportunity for so long, I’ve been around the sport since I was ten years of age and in that time every single training session, every spar and every fight I’ve ever had has been leading to this fight, I can’t wait for Saturday night, it’s my dream to win a title. “I can’t help but think that this fight has all the hallmarks of being a seriously good all action fight the fans will love to watch. “I believe styles make fights, the difference in our styles, as well as the way we approach fights make this a very interesting match-up. It’s going to be a war on Saturday night. “Like most boxers on the Liverpool circuit, I know Paul’s ability and believe me I’m not taking anything lightly, he’s a good technical boxer with a strong amateur pedigree. “I’m unbeaten in the pros and believe me I don’t intend on losing my ‘0’ anytime soon. “Although I have respect for Paul, I’m here to win. I’m in the best shape of my life, I’m hitting harder and faster than ever before and because of that I have every confidence that it will be me that lifts the belt come fight night. Craig Kennerdale versus Paul Peers for the Professional Boxing Council (PBC) Silver English Welterweight title supports co-headliners Ross Doherty versus Gvido Seilis World Boxing League and European Boxing League European Welterweight Championships contest and Nathan Decastro versus Agoe Ashong, Professional Boxing Council (PBC) Commonwealth Super Middleweight Championship contest on the Daniel Gray promoted event at Pride Park in Derby on Saturday 29th September 2018. There are also two non-championship contests featured on the event, exciting Super Bantamweight Emily Pugh makes her second pro outing against Latvia’s Veronika Sirajeva and Leed’s Super lightweight Jack Jones makes his professional debut against Dundalk, Ireland’s Michael Kelly. 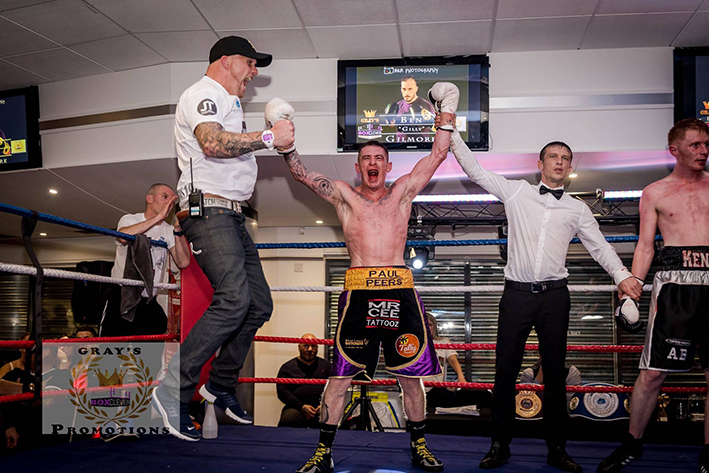 Posted in News Tagged Agoe Ashong, Craig Kennerdale, Dan Gray, Derby, Emily Pugh, Gvido Seilis, Jack Jones, Michael Kelly, Nathan Decastro, Paul Peers, PBC, Pride Park, Professional Boxing Council, Ross Doherty, Viktoria Sirajeva 1 Comment on Kennerdale: It’s Going to be a War on Saturday Night! 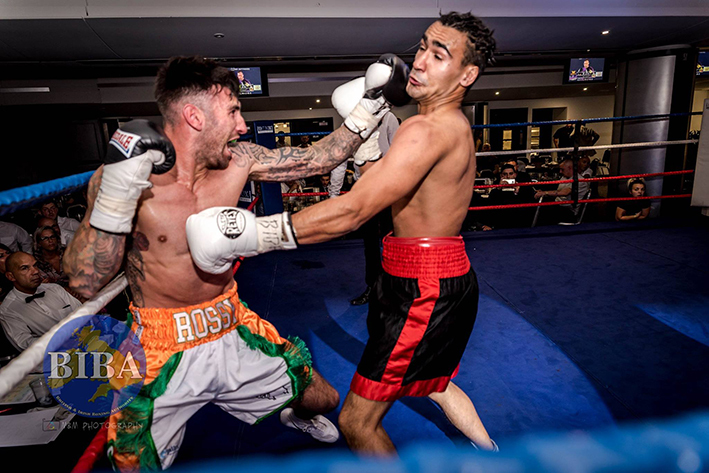 Derby’s unbeaten Welterweight prospect Ross Doherty appears in confident mood ahead of his first Championship contest, against Latvian Gvido Seilis this coming Saturday, the 29th September, on the Dan Gray promoted event at Pride Park in Derby. Doherty has been mighty impressive, since bursting on to the professional scene, with a solid points victory over Belfast’s Marty Kayes back in September 2016, which he followed up with a series of solid points victories over the past two years, culminating in a sensational performance, and yet another shutout points victory, against another tough Latvian, Grigorijs Dunecs, in an eight rounder back in April this year. It was this particular performance against Dunecs that led promoter Dan Gray to decide it was time for his charge Doherty to step up and challenge for Championship honours, as such on Saturday night, Doherty and his opponent Seilis are set to go toe-to-toe for both the World Boxing League (WBL) and European Boxing League (EBL) European Welterweight Championships. “My training camp has gone very well, Dan Gray pushed me to my limits in training as well as arranged some seriously top class sparring for me. “My opponent has changed, I don’t know too much about Gvido Seilis, other than he seems a very tough lad. Would normally have video footage of the opponents fights in plenty of time, which helps in us to adapt to the opponent’s style, however not the case this time, but we’re not worried, the camp was that good. Ross Doherty versus Gvido Seilis for the World Boxing League (WBL) and European Boxing League (EBL) European Welterweight Championships, co-headlines with the Nathan Decastro versus Agoe Ashong, for the Professional Boxing Council (PBC) Commonwealth Super Middleweight Championship contest on the Daniel Gray promoted event at Pride Park in Derby on Saturday 29th September 2018. Also featured on the event is another mouth-watering all Merseyside title clash, between Craig Kennerdale and Paul Peers for the Professional Boxing Council (PBC) Silver English Welterweight title. There’s nothing quite like a local Derby, whether Football or any sport but especially Boxing, to get the fans salivating and when it’s an all Merseyside clash it is without doubt the most mouth-watering of them all. On Saturday 29th September, on neutral ground at Pride Park in Derby, the home of Derby County Football Club, life-long Everton fan Paul Peers will step into the ring against fellow Merseysider and staunch Reds fan Craig Kennerdale. Adding extra spice to the contest, if being a Merseyside Derby wasn’t enough; there will be a Title Belt at stake, the Professional Boxing Council (PBC) Silver English Welterweight Championship. Speaking from his new home in the Orkneys, Peers made it clear he wasn’t just coming to make up the numbers. “I’m really looking forward to this fight, it’s one that could and should have happened last year. “We’re both from Liverpool, there’s no two ways about it the depth of talent in the city is growing all the time. Liverpool has produced so many Champions over the years, everything from English to World Champions, hopefully after the 29th my name will be added to the long, long list. “I have every intention of boxing at my very best as I try to win this English title, as will Craig. “I’ve seen that Craig is right up for this, he looks even faster now than when I see his training videos. That shows he’s fit and he’s ready, which makes for a good fight, as so am I.
Craig Kennerdale versus Paul Peers for the Professional Boxing Council (PBC) Silver English Welterweight title supports co-headliners Nathan Decastro versus Agoe Ashong, Professional Boxing Council (PBC) Commonwealth Super Middleweight Championship contest and Ross Doherty versus Gvido Seilis World Boxing League and European Boxing League European Welterweight Championships bout on the Daniel Gray promoted event at Pride Park in Derby on Saturday 29th September 2018. Bardley. 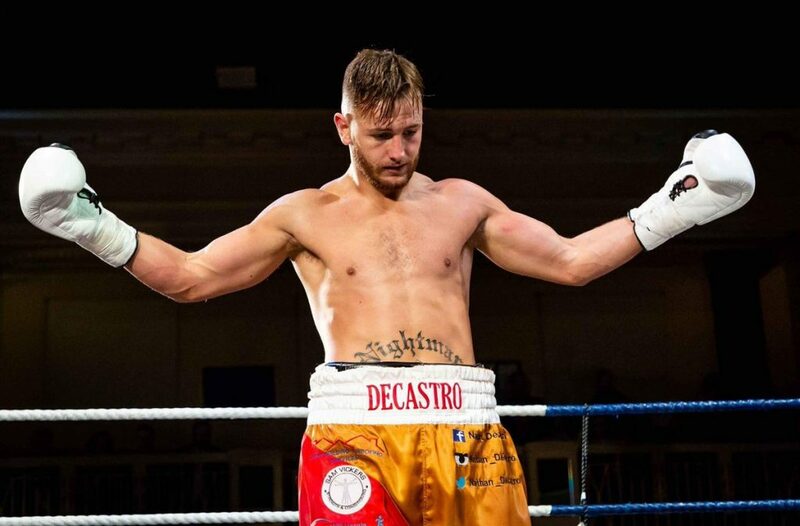 Lincolnshire’s Decastro is set to face two time African Champion Agoe Ashong (11-1-0 (6 by way of KO)) for the Professional Boxing Council (PBC) Commonwealth Super Middleweight Championship, on the Dan Gray promoted event at Pride Park in Derby on the 29th September 2018. Decastro, who is ranked #9 in the International Boxing Federation (IBF) Intercontinental ratings, was originally due to go toe to toe with Ashong back in July on the undercard of the McAllister versus Williams WBU Heavyweight World Title clash headed event in Aberdeen, however due to delays in the African Champion receiving his visa in time, Decastro instead had to settle for a non-championship eight rounder against David Okai. Decastro came through the test against Okai with flying colours with a first round stoppage victory, his eleventh TKO victory in thirteen outings. Late in August Ashong’s visa situation was finally sorted thanks to the intervention of the Secretary of State for Immigration, Caroline Nokes MP and James Snowdon and his team at the Home Office, making it possible for this mouth-watering 50/50 title clash to finally take place. Earlier today Decastro spoke briefly about the upcoming fight Ashong. “I am so pleased to get the opportunity to fight for the PBC Commonwealth title and really excited for this fight, especially after the disappointment of his visa issues last time, therefore not making the scheduled fight! “That’s behind me now and it’s all sorted, I’m going to make a big statement next week and show I really mean business and deserve my IBF ranking and a shot against any of those ranked above me for the vacant IBF Intercontinental title. “Agoe Ashong is a quality fighter and that’s proven with his record 11-1 and the two African titles he’s won, but for me to progress towards world titles and improve my ranking with IBF I need to be winning in great style. “I’ve been promised a huge fight in December, by my manager Lee McAllister as long as I win on the 29th, which I fully intend to do. “I would just like to thank my traveling supporters and also my team and Sponsors: Bracebridge Boxing Club, Tudor Building and Roofing, Flawless Landscaping and construction, Aesthetics by Megan, GA Luxury Breaks, Get The Edge UK, SMT2U, Sam Vickers my S&C coach and Craig Barton my nutritionist! 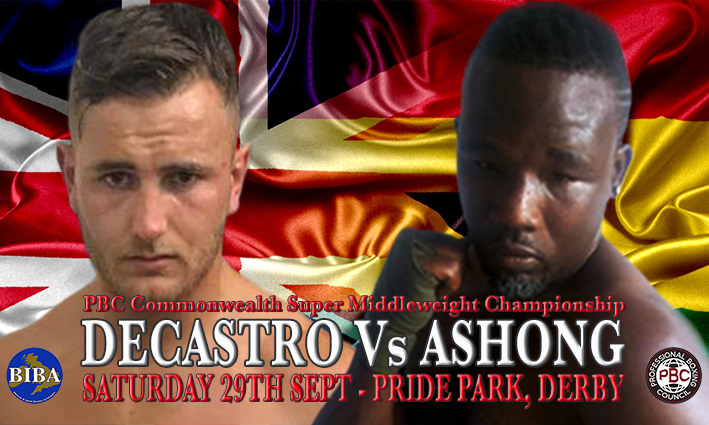 Nathan Decastro versus Agoe Ashong, for the Professional Boxing Council (PBC) Commonwealth Super Middleweight Championship, co-headlines with the Ross Doherty versus Gvido Seilis World Boxing League and European Boxing League European Welterweight Championships contest on the Daniel Gray promoted event at Pride Park in Derby on Saturday 29th September 2018. 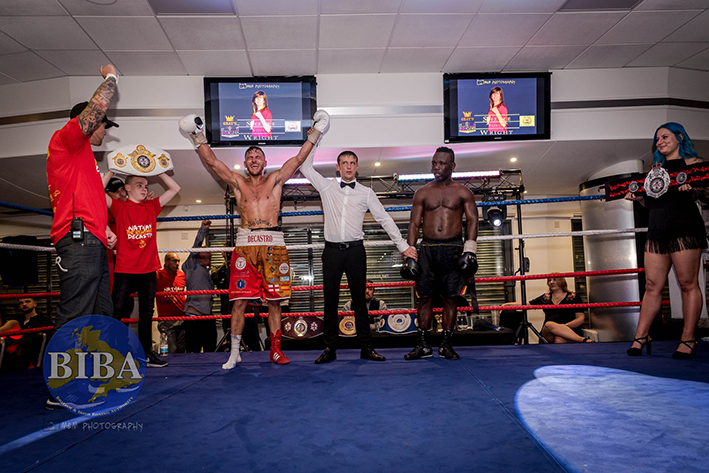 Posted in News Tagged Agoe Ashong, Commonwealth Championship, Craig Kennerdale, Dan Gray, Derby, Emily Pugh, Gvido Seilis, IBF, International Boxing Federation, Jack Jones, Michael Kelly, Nathan Decastro, Paul Peers, PBC, Pride Park, Professional Boxing Council, Ross Doherty, Veronika Sirajeva Leave a Comment on Decastro Fires Warning Shot Across Ashong’s Bow Ahead of Commonwealth Title Clash on 29th September. Promoter Kyle Gallagher announced earlier today that unbeaten Welterweight prospect Jonny McConville, is set to challenge Chandigarh India’s Neeraj Goyat for the Professional Boxing Council (PBC) International Silver Welterweight Championship, at the Jubilee Sports Bank in Liverpool on Saturday 8th September 2018. McConville is in fine form and comes into this Championship contest off a first round stoppage win over Belfast’s Michael Kelly back in March this year, his third stoppage win in as many contests, the other stoppage victories being over Marty Kayes in December 2017 and Will Cairns in September 2017. However McConville is in no doubt that this will be the toughest fight of his young career to date, his esteemed opponent on the 8th September is not only far more experienced but also Championship experienced, having been crowned the World Boxing Council (WBC) Asian Boxing Council Welterweight Champion following his victory over Nelson Gulpe in New Delhi back in May 2015 and successive successful defences against Ben Kite in New Delhi back in October 2016 and then against Allan Tanada in Mumbai in August 2017. 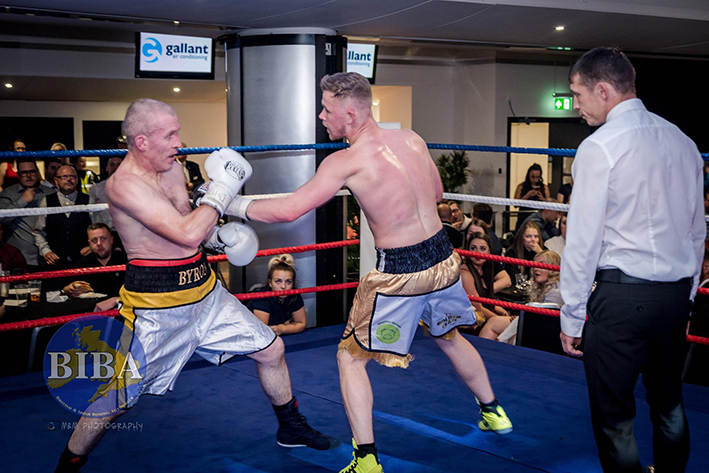 By time Goyat faces McConville he may have successfully defended his title for a third time, as he is currently in camp preparing to defend his title in Canada later this month. His esteemed opponent’s Championship successes do not seem to have fazed McConville one iota, as he made clear when he spoke earlier. “I’m very grateful for this opportunity it’s something we have been working and training very hard towards. “I am very excited to fight for my first title and to put on a show against such a decorated and experienced opponent as Goyat. 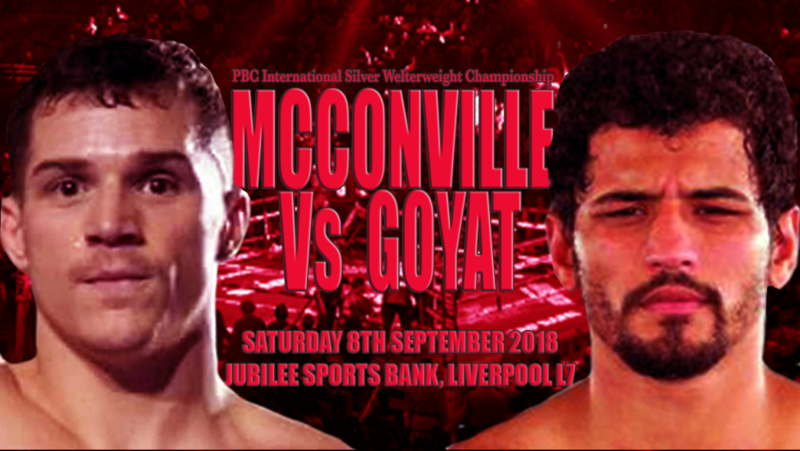 Jonny McConville versus Neeraj Goyat for the Professional Boxing Council (PBC) International Silver Welterweight Championship will take place on the Kyle Gallagher promoted Victory Fight Club event at the Jubilee Sports Bank in Liverpool on Saturday 8th September 2018. 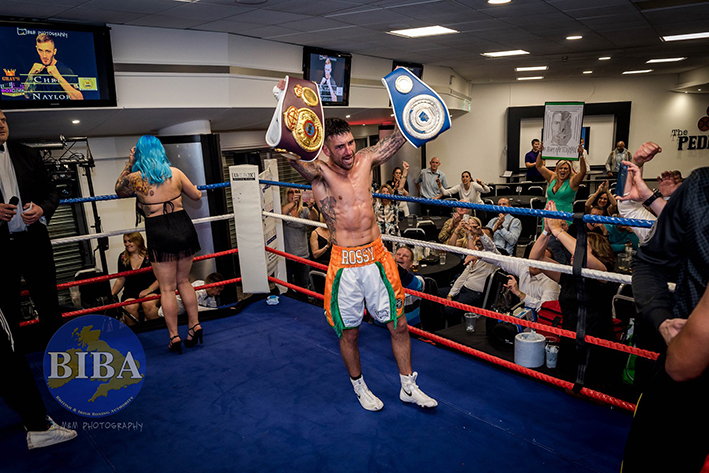 The British & Irish Boxing Authority (BIBA) today announced that former Boxing Union of Ireland (BUI) National Ireland Super Welterweight Champion and current A Class Referee as the Head of Ring Officials effective immediately. Murtagh, who had a stellar 51 fight pro boxing career which culminated in a trip to Rochester, New York to fight Hector Camacho Jr. in August 2013. Shortly after hanging up his gloves, Murtagh trained as a referee for the Malta Boxing Commission (MBC), after passing the course with flying colours and just ten months after boxing for the final time, Murtagh was charged with officiating his first contest, Tyrone Borg versus Zoltan Szepesikb at the Ex Triad Fairgrounds in Naxxar, Malta. 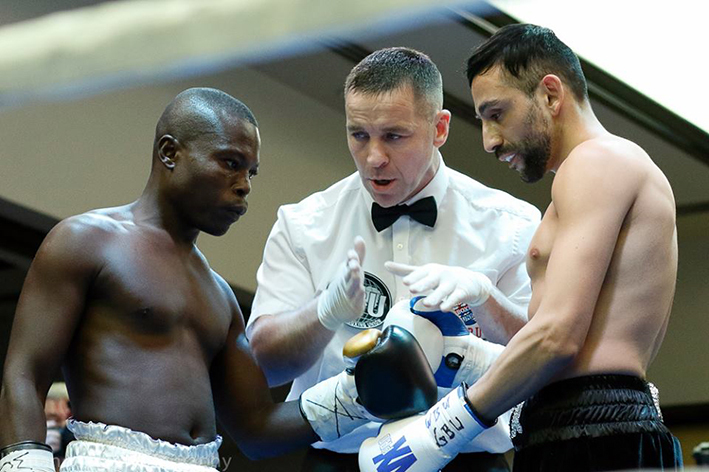 Back in April this year, after refereeing and judging some eighty plus contests, Murtagh received the call to referee four contests in Nigeria, three of which were World Boxing Union (WBU) Championship bouts – Demarcus Corley versus Patrick Lopez for the World Lightweight Crown, Paul Venenzuela Jr versus Aaron Coley for the World Middleweight title and King Davidson versus Ishmael Tetteh for the African Middleweight belt. Murtagh’s refereeing skills impressed Nigeria Boxing Board of Control (NBBofC) President Dr. Rafiu Ladipo and Secretary General Remi Aboderin so much so that they have since licensed Murtagh. “I am so pleased to announce that Lee Murtagh has been appointed as the new Head of Ring Officials for the British & Irish Boxing Authority. “Appointing Lee was a no-brainer, undoubtedly he’s been one of the best referees, if not the best, in the UK for a while now. “Lee has proved over and over again just how good he is, but I suppose the clincher was his first class performance over in Nigeria, I was there and can say that without doubt his refereeing was faultless. Murtagh’s next assignment is just over a week away, when he Referees two Championship contests – Tommy Jacobs versus Bilal Mohammad for the World Boxing Foundation (WBF) International Super Welterweight Crown and Iain Weaver versus Emmanuel Addo for the Professional Boxing Council (PBC) International Lightweight Championship at the Charter Hall in Colchester on Saturday 30th June 2018.